April 2nd marks World Autism Awareness Day. Autism, or Autism Spectrum Disorder (ASD), is a neuro-developmental disorder that affects social communication, interaction, and self-regulation. As it presents itself differently in each individual, every child is different with his own set of strengths and challenges. According to local figures, 1 in 150 children in Singapore has ASD. In recent years, the number of children diagnosed with autism has gone up and there is now a greater focus on addressing the needs of this community. For many parents, the challenge is not simply getting their child to the right therapy, but also maintaining their marriages, coping with their work lives, and adapting to a new meaning of ‘normalcy’. 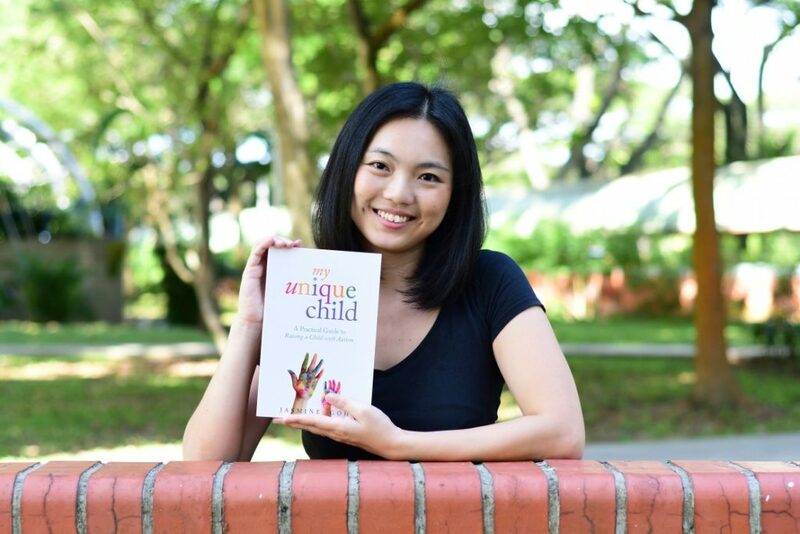 We sat down with Jasmine Goh, author of My Unique Child: A Practical Guide to Raising A Child with Autism, to talk about her new book and advocacy work. My Unique Child is a guide book for families who have a child with autism. It provides parents, caregivers, and educators with practical tips and resources throughout the lifespan of the child, from diagnosis to adulthood. When I first entered the autism space in 2009, there was very little local literature on ASD. Almost everything we read and learnt from was from the West. As Asians, we raise our children differently. This book offers advice and stories that are relevant to a modern Asian family. What led you into the autism space? My church at that time wanted to start an activity group for children with ASD and so they were looking for volunteers. I was an undergrad in university and exploring different career paths. I was curious and signed up as a volunteer. How did you go from volunteering to writing a book? Besides serving in the church’s activity group, I also went out and volunteered in special schools. I attended workshops and courses on autism and read up as much as I could. It opened my eyes to a different side of society. After a few years, I contemplated changing careers and becoming a special education teacher. By that time, I was working as a writer in a publishing company. As I was considering the career switch, it occurred to me that as a writer, I could still serve the autism community. I don’t have to fit into the traditional roles of a teacher, psychologist, or therapist. I can contribute as a writer! What is the main takeaway you’d like readers of My Unique Child to leave with? My Unique Child has practical tips for each stage of development. While I hope readers find these tips helpful in their lives, I want them to know, more importantly, that there is hope. They are not alone on this journey. Now that the book is out, what’s next? Besides volunteering in the special needs community, I’ve started doing more advocacy work. I give talks on autism and special needs in schools and churches. I also started OurUniqueStories.com. It is an online platform for special needs individuals and their families to relate first-hand accounts of their experiences. This gives them a voice and also allows the public to have a glimpse into their lives. My Unique Child: A Practical Guide to Raising A Child with Autism was released in August 2018. The book is available for purchase on www.ouruniquestories.com and at authorised retailers. Tueetor is giving away a FREE copy of My Unique Child to 2 lucky followers! Hop over to our Facebook page to win this giveaway!